You all know Groupon and I'm sure most of you have used it in the past (I know I have on multiple occasions!). 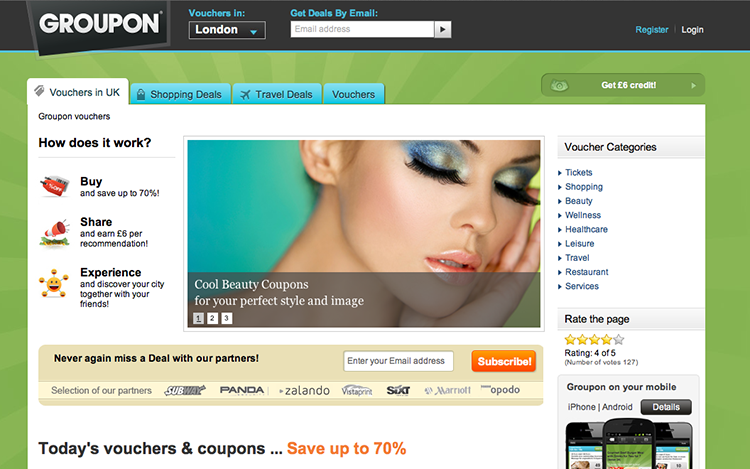 So, today, I am delighted to announce that I've teamed up with Groupon to giveaway a 40 pound voucher to one lucky reader! Take a look here to see some of their exciting current and past deals and to get an idea of the variety of products and services they offer! The voucher is redeemable on any kind of good or service and is valid for six months. The winner will of course be chosen randomly. The giveaway will be open for one week (until March 19th) and I will send the voucher to the winner by email! Then, leave a comment below with your email address so I can send you the code! Easy peasy! Good luck to all! great!! I have taken advantage of their daeals so many times. Following you on Bloglovin since a looong time ago dear.